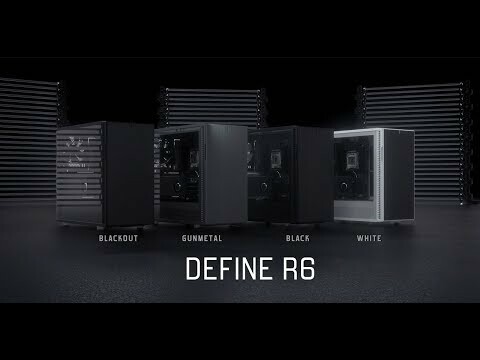 Product Overview Designed from the ground up, the Define R6 goes beyond iteration with a profound stride of innovation – the latest and largest step in the legacy of the world-renowned Define Series. Seamless tempered glass* and sound dampened steel panels encase a fully redesigned interior with more storage capability than ever before, and with nine fan mounts, PWM fan hub, and 420mm radiator support, the R6 is the perfect platform for building your dream water loop. Improved third generation ModuVent™ technology allows an effortless transition from metal-clad sound dampened top panel to filtered high airflow multi-fan ventilation. • Brushed Aluminium: A reversible front door with anodized aluminium cover provides adaptability with elegance. • Third Generation ModuVent™ Technology: An advanced new design gives users the choice between a soundproof steel cover or filtered multi-fan ventilation in the top panel. • Two Cases in One: Easily convert between the Standard Layout for maximum storage capacity or the new Open Layout for superior water cooling support and clear path of air flow. • A Place for Everything, And Everything in Its Place: The ventilated power supply shroud and Modular Storage Plate offer a multitude of mounting options to arrange drives and conceal excess cabling for a clean, clutter-free interior. • Nexus+ Smart Hub: The new Fractal Design Nexus+ smart hub offers superior fan control of six additional case fans plus three PWM devices via your motherboard. • Ideal for: Users looking for a case that excels in flexibility and silence with classic Fractal Design style and sensibilities. Features • Full-size seamless scratch-resistant tempered glass side panel (Tempered Glass Versions Only). • Optimized for silence with high-density industrial dampening on side, top and front panels. • Reversible front door with anodized aluminium cover and dual mounting system for adaptability with elegance. • Nine fan positions with intuitive layout and clear airflow paths offer massive cooling capacity. • Extensive water cooling support with room for up to a 420 mm radiator in the top, 360 mm in the front, and up to 280 mm in the base. • Power supply shroud and Modular Storage Plate conceal HDD trays and excess cabling for a clean, clutter-free interior. • Third generation ModuVent™ technology gives users the choice between a soundproof steel cover or filtered multi-fan ventilation setup in the top panel. • Easy-to-clean high airflow nylon filters on the front, top, and base with full PSU coverage and front access for convenience. • Modular Storage Plate lets users easily convert between the Standard Layout for maximum storage capacity or the new Open Layout for superior water cooling support and clear air flow paths. • Vertical 2.5 slot GPU mount showcases your graphics hardware with full visibility (PCIe Riser Not Included, Available Separately). • Highly modular interior includes six universal SSD/HDD trays that can be independently repositioned to suit components, cooling, and cable routing. • Customizable 2.5” storage solution consists of two brackets and a choice of four tray locations to keep drives hidden behind the motherboard tray or display them prominently on top of the PSU shroud. • USB 3.1 Type C compatible with Fast Charging support via Define Pro I/O Panel (Not Included, Available Separately). Fractal Design Define R6 Tempered Glass Gunmetal, Mid Tower Computer Chassis, E-ATX/ATX/mATX/mITX, 3x 140mm Fans is rated 5.0 out of 5 by 2. Rated 5 out of 5 by delcamp from Best mid tower for me. Bought this case to replace my Corsair Carbide 500R which has served me for many years. After a good bit of research on the net I decided on this Fractal Define R6. It has not been a disappointment the looks are amazing and installing into it has been hassle free. Lots of room for whatever you want to install and some very innovative ideas such as dust filters at top, front and side. A very well built and a sturdy case which should serve me for some time yet. Is there a way to change the colour of the LED's in this case? If I put a kraken x72 on the front could I still but two 140 fans on the bottom?